Leicester subcontract machinists, Nisan Engineering, was recently awarded a new contract to machine stainless steel splitter valves used in the food industry. 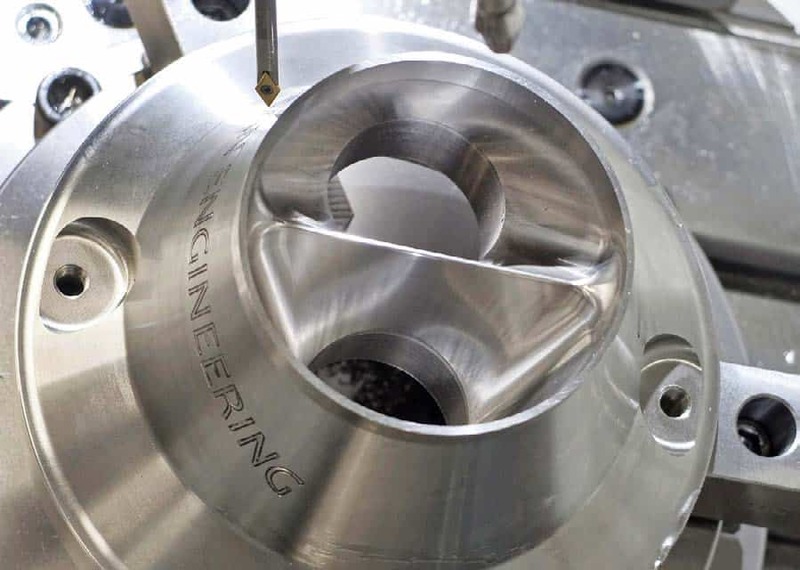 Complex internal profiles dictated the need for full simultaneous 5-axis machining, so managing director Mukesh Prajapati set about acquiring suitable capacity for the work. After researching the market, he decided that a Spinner U5-620 5-axis VMC from Whitehouse Machine Tools (www.wmtcnc.com) was ideal. The German built machine, which was compared against competitive products from Japan and Korea, was considered to be the most robustly built, particularly with respect to the heavy duty support at the front of the machine for the non driven side of the trunnion. Mr Prajapati’s estimation was that the machine would hold tight tolerances for at least a decade and probably for up to 15 years. This is a benchmark for all purchases at the Leicester factory. The new VMC, with Siemens 840 D-SL control, 22 bar through spindle coolant, Blum wireless infrared touch probe and mist extraction, was purchased in August 2014 along with a seat of SolidCam software. This was also considered best of breed, with its advanced cycles including iMachining, which considerably reduces roughing times and at the same time prolongs tool life. Forming part of a new range of food industry products launched recently by the customer, the family of five twin-cavity splitter valves is produced from 1 solid stainless steel billets varying in diameter from 76 mm to 158 mm. 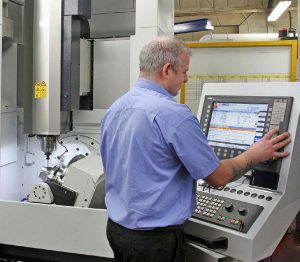 Two operations are required per component, the first of which involves turning the billet on a CNC twin turret, twin-spindle turning centre. Two factors in particular complicate the second, prismatic machining operation. One is an undercut at the top of both cavities that would prevent a tool in the spindle of a 3-axis machine accessing some areas of the profile. The other is a requirement for a surface finish of 0.8 Ra or better to discourage bacteria from accumulating on the contoured surfaces over which food flows. A machine capable of simultaneous 5-axis machining was the answer and had the added advantage of being able to engrave the necessary traceability data onto a curved surface of the component using the 5-axis capability. This eliminated a separate laser marking operation, which was previously subcontracted. The CADCAM software is an integral element in achieving the surface finish as well as dimensional tolerances down to 0.05 mm. Ten potential carbide tooling providers were reviewed and premium 2 brand supplier MA Ford was chosen. It takes 1.5 hours to complete the turned profile of the largest splitter valve initially and a further five hours to complete the machining on the Spinner 5-axis VMC. The finishing passes alone for the two cavities, involving 0.075 mm stepovers using a solid carbide ball nose cutter, consumes 3.5 hours of machine time. Mr Prajapati commented, “Splitter valve volumes will hopefully grow over the next five years, but at present the contract occupies our Spinner U5- 620 for only about one quarter of the time. “We carried out market research before investing in the machine and saw considerable business opportunities. Although there are plenty of subcontractors offering 3+2 and even 4+1 CNC milling, there are not many companies of our size with full simultaneous 5-axis capabilities and capacity. “It is an area we have been keen to break into for some time and the splitter valve project was the perfect opportunity to trigger the investment. “We have already done a couple of jobs in certified 316 stainless for a major petrochemical company and are actively selling the spare 5-axis capacity. He was complimentary about the involvement of the machine agent, Whitehouse Machine Tools, with which Nisan has had a relationship that he describes as “second to none” dating back more than 20 years. The supplier’s commitment was especially evident in the early stages of the splitter valve project when the machining process was being developed. It was carried out at another company that operates a similar U5-620 and involved a Whitehouse applications engineer on site together with a SolidCam expert and Mr Prajapati with a newly purchased surface roughness tester to check the results. Indeed, the first components supplied to Nisan’s customer were machined at the third party’s factory. It is noteworthy that the splitter valves are being produced for an existing Nisan customer that specialises in manufacturing flow meters used in the oil, gas and food industries worldwide. 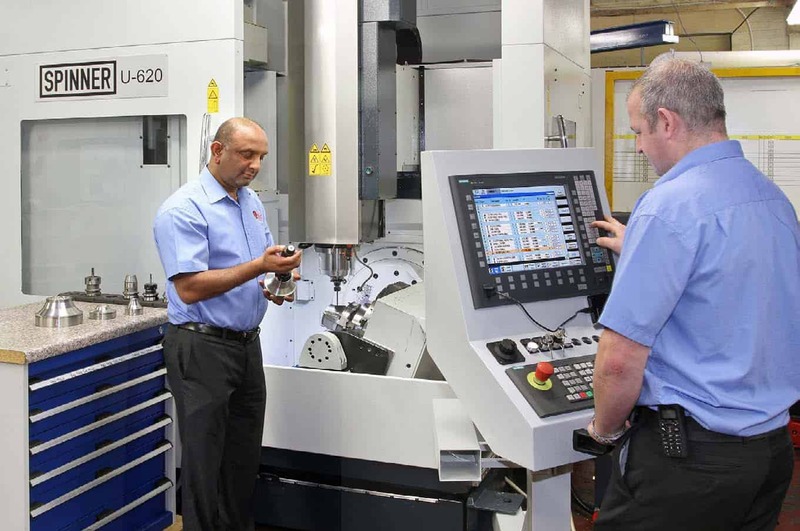 The relationship began in November 2012 when the subcontractor started producing a family of 10 cylindrical components on an Akari twin-pallet, 4-axis, horizontal machining centre supplied by Whitehouse Machine Tools. The parts were reengineered by Nisan at the outset to secure quality and continuity of production and to shorten lead-times for the customer’s premier product line. Work for this firm is carried out alongside the subcontractor’s ongoing business servicing many different sectors including medical, auto sport, rail, marine and yellow goods. New this year (2015) at the Leicester factory is an LK Altera 8.7.6 CNC coordinate measuring machine supplied by Nikon Metrology, which also upgraded the software on an existing Mitutoyo manual CMM on site.